What clock is this really? I have been told it is a Sessions Store Regulator clock. But the Regulator A model I have not been able to find a duplicate of online. THis clock looks most similar almost exactly like The "Observatory" by W.M. L. Gilbert Clock Company. Anyone know what the real story is on this piece? This Clock Has Me Stumped!! 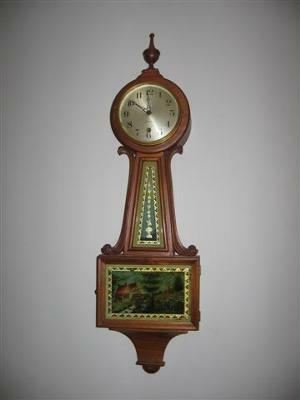 This clock has a porcelain face(cover) it is attached to a wood square box 9-1/2 by 9-1/2 by 3" thick. The porcelain cover is hinged to the wood box. 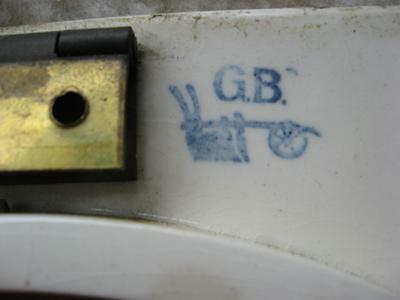 The back of the cover has the initials G.B. over something that looks like a old plow. The dial is porcelain,it is 7" in diameter,the dial is not marked. 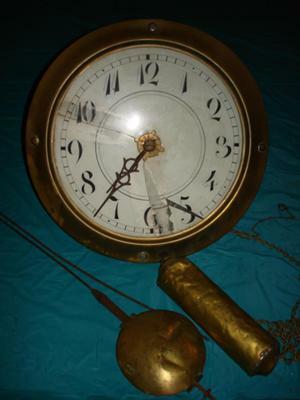 The clock works are brass and it is stamped Bossenroth Germany,it has an unmarked pendulum. Thank you in advance to the person who provides info on this clock. Numerous paint slaps but she's still a beauty. This much I do know: For many, many years this 1906 Coca Cola advertising wall clock adorned a drug store's wall in Norfolk, Virginia. Each time the walls were painted, they just painted right over the clock(except for the glass). In the end, it had over 32 layers of paint slapped on it. I removed every single one, layer at a time. Crazy. I am curious what it's current value might be. When my father retired we spent the next 20 years collecting antique clocks. He died in 2006 and I now have all of his clocks. One of the clocks I have is a Banjo Clock with "Richard Duke" "Muncie Indiana" on the face. The works are marked K&B and is single weight driven. The case is a very beautiful bold tiger maple with beading. 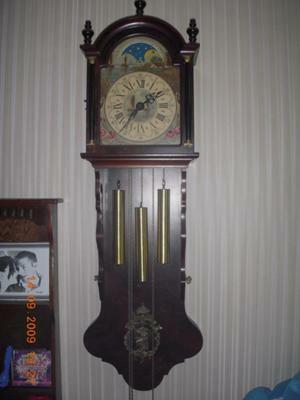 The front glass is beautiful reverse painting and the overall clock measures about 43" tall. Does anyone have information on when this clock was made, on Richard Duke, and the works in this clock. Any info would be greatly appreciated. Additional picture for Clock has me stumped. 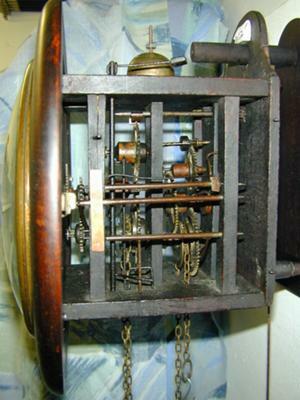 This is a wooden framed, wooden spindle clock, brass gears with steel pinned small gears in wood. Mounted at face level, it requires re-winding every 12 or so hours. The length of chain would almost make it for 24 hours but then it would have to be mounted over 10 feet high. After my careful restoration, it keeps perfect time. My question, "Where does it come from and how old is it?" Any remarks about it's value would be welcome too. The only markings are on the brass hinge which holds the glass front, it is marked B & Co. Improved, or maybe it is G. & Co. Thanks for any help. I also have a good picture of the front. 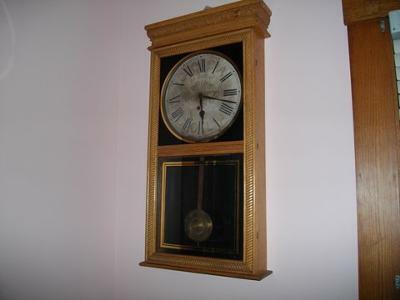 The story in our family is "My Aunt Bessie received this Banjo Clock in Mahogany retaining original reverse painted throat and tablet glass." as an engagement gift. She was married in 1914. 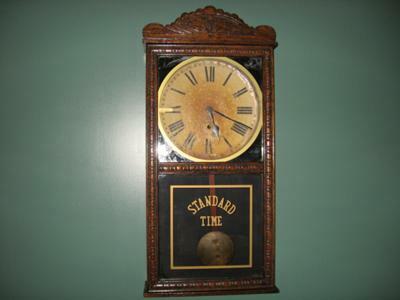 We would like to be able to add this clock's history to our family history. 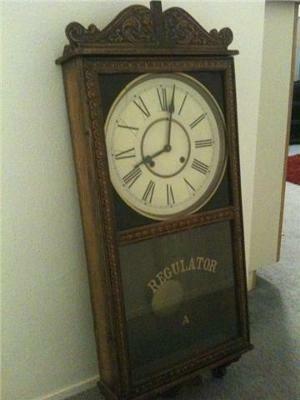 Is there a known value for this clock for insurance purposes. Thank you. 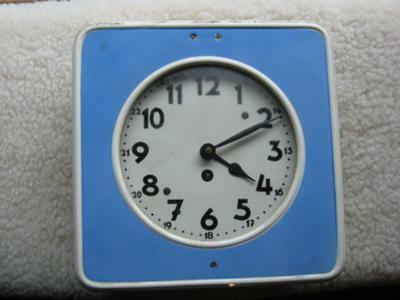 I know that my Oma (grandma) in Holland got this clock in the late 60's. That is all I know. I have no idea where it came from. She shipped it over to the United States when she moved here in the mid 70's and then gave it to me. I would like to know what it may be worth, it looks now just like it did back then, the weight is all beat up looking and that is how it was when we got it.